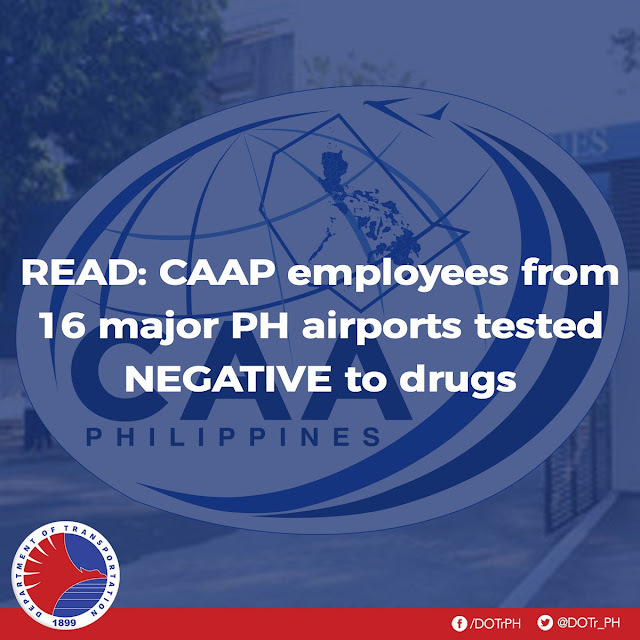 Civil Aviation Authority of the Philippines (CAAP) employees from 16 major airports around the country tested negative to drugs. In line with the Duterte administration’s anti-drug efforts and as part of DOTr and CAAP’s campaign for a drug-free workplace, the agency’s Office of the Flight Surgeon and Aviation Medicine (OFSAM) conducted random drug testing from February 7 to May 4 this year where 2,187 employees from the 16 airports took part. The drug tests are done yearly in accordance to Republic Act 9165 or the Comprehensive Dangerous Drugs Act of 2002, as well as the Civil Service Commission’s memorandum circular 13 (series of 2010), calling for a drug-free workplace, and the Philippine Civil Aviation Regulation on Psychoactive Testing and Reporting that requires drug testing on airport personnel. Among the major airports tested were Davao International Airport and Laguindingan Airport in which 298 and 264 CAAP employees respectively, tested negative to illegal drugs. The rest of the 16 participating airports include: Tuguegarao Airport (86), Laoag International Airport (107), Cebu-Mactan International Airport (93), Kalibo International Airport (136), Dumaguete Airport (83), General Santos International Airport (136), Puerto Princesa International Airport (153), Zamboanga International Airport (127), Iloilo International Airport (260), Tagbilaran Airport (108), Plaridel Airport (52), Tacloban Airport (121), Roxas Airport (72), and Surigao Airport (91). The random drug tests are also in accordance to CAAP’s mission of ensuring a safe, secure, and green Philippine skies. “We remain true to our commitment to rid our workplace of people not only involved in corruption, but also in drugs. Ayaw ng Pangulo ‘yan. Ayaw natin yan. Such illegal activities shall not be tolerated under our watch. Pasensyahan tayo kung mahuli kayo,” DOTr Secretary Arthur Tugade said. The aviation regulator manages 86 airports nationwide while four others are controlled by other airport authorities—the Ninoy Aquino International Airport, Subic Bay International Airport, Clark International Airport and Cebu-Mactan International Airport. As the Philippines’ aviation safety oversight mechanism, CAAP is responsible for providing safe and efficient air transport and regulatory services in the country. Stationed at the Old MIA Road in Pasay City and in 12 area centers around the Philippines, CAAP employs approximately 6000 employees.